Well, it’s the first of April, and we all know what that means. That’s right, it’s the start of National Grilled Cheese Month! Yes! You read that correctly! An entire month to celebrate the gloriousness of the grilled cheese sandwich, arguably one of the world’s greatest foods. It’s almost too good to be true. And no, this is not some sort of cruel April Fool’s joke. National Grilled Cheese Month is a real thing! I don’t know about you, but that makes me pretty happy. As a serious grilled cheese aficionado, I’m sure you can imagine how excited I get this time of year. And as you might imagine, kicking off a month of grilled cheese goodness by whipping up a lovely gooey, grilled cheese sandwich is a given for me. The trick is where to begin. I mean really, you can do a lot with grilled cheese. While I’m always down for a straight-up plain jane grilled cheese, I often enjoy dressing my cheesy concoction up with some tasty add-ons. Bacon is a no-brainer, as are tomatoes (especially slow roasted). Roasted red peppers are fantastic. 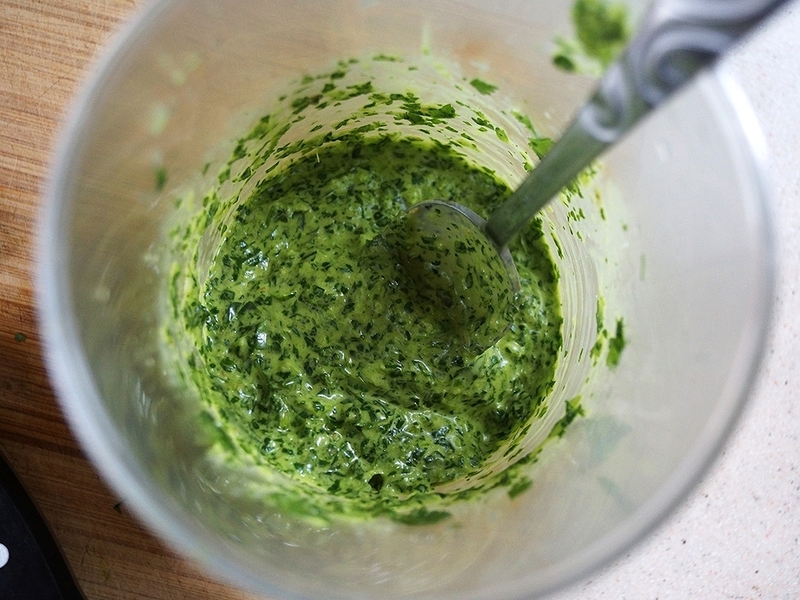 Pesto is always divine, no matter what kind you use. Caramelized onions? Kimchi? Pico de Gallo? Yes, yes, and yes. I mean, honestly, the possibilities are infinite. So I’m sure you can imagine I had a tough time deciding on a recipe for today’s grilled cheese. After all, as the kickoff sandwich to Grilled Cheese Month, it had to be something pretty fantastic. But with so many fantastic options, narrowing them down and producing a winner was going to be a challenge. Challenge accepted. At last, I came up with a pretty amazing specimen - the avocado and chimichurri grilled cheese. Melty havarti, creamy avocado, green, grassy, and slightly spicy chimichurri, all combine to make one amazing sandwich. Oh, and did I mention it’s grilled in Sriracha butter? Yes. I went there. It’s amazing. Also, for more grilled cheese goodness, try making this lovely, fig and camembert version. And don’t forget to whip up a big pot of tomato soup to accompany all of your grilled cheese snacking! 1. Mix the butter and Sriracha sauce together until the are fully combined. 2. Place a griddle or skillet on the stove and heat to medium heat while you prepare your sandwich. 3. Spread a quarter of the butter on one side of each slice of bread. Place one bread slice butter side down, and top with 1 Tbsp chimichurri, half of the cheese, half of the avocado slices, and the other slice of bread, butter side up. Repeat with the other bread slices and ingredients to make the second sandwich. 4. Place the sandwiches onto the heated griddle and cook, flipping once, until bread is golden brown on both sides and cheese is melted, about 2 minutes per side. 5. Slice sandwiches in half, and eat immediately. 1. Combine all ingredients in a blender or food processor and process until mixture reaches a smooth consistency, about 30 seconds.